In ecology, a biogeochemical cycle is a circuit or pathway by which a chemical element or molecule moves through both biotic ("bio-") and abiotic ("geo-") compartments of an ecosystem. In effect, the element is recycled, although in some such cycles there may be places (called "sinks") where the element is accumulates for a long period of time. All chemical elements occurring in organisms are part of biogeochemical cycles. In addition to being a part of living organisms, these chemical elements also cycle through abiotic factors of ecosystems, such as water (hydrosphere), land (lithosphere), and air (atmosphere); the living factors of the planet can be referred to collectively as the biosphere. The biogeochemical cycles provide a clear demonstration of one of the fundamental principles of biological systems: The harmonious interactions between organisms and their environment, both biotically and abiotically. All the chemicals, nutrients, or elements used in ecosystems by living organisms—such as carbon, nitrogen, oxygen, and phosphorus—operate on a closed system, which means that these chemicals are recycled, instead of lost, as they would be in an open system. The energy of an ecosystem occurs in an open system; the sun constantly gives the planet energy in the form of light, which is eventually used and lost in the form of heat, throughout the trophic levels of a food web. Although components of the biogeochemical cycle are not completely lost, they can be held for long periods of time in one place. This place is called a reservoir, which, for example, includes such things as coal deposits that are storing carbon for a long period of time. When chemicals are held for only short periods of time, they are being held in exchange pools. Generally, reservoirs are abiotic factors while exchange pools are biotic factors. Examples of exchange pools include plants and animals, which temporarily use carbon in their systems and release it back into a particular reservoir. Carbon is held for a relatively short time in plants and animals when compared to coal deposits. The amount of time that a chemical is held in one place is called its residence time. The most well-known and important biogeochemical cycles include the carbon cycle, the nitrogen cycle, the oxygen cycle, the phosphorus cycle, and the water cycle. These are briefly summarized below. The nitrogen cycle is a complicated biogeochemical cycle, and is only summarized here. This cycle involves living components, water, land, and air. Nitrogen is a very important element in that it is part of both proteins (present in the composition of the amino acids that make those proteins) as well as nucleic acids, such as DNA and RNA (present in nitrogenous bases). The largest reservoir of nitrogen is the atmosphere, in which about 78 percent of which made up of nitrogen gas (N2). Nitrogen gas is “fixed,” in a process called nitrogen fixation. Nitrogen fixation combines nitrogen with oxygen to create nitrates (NO3). Nitrates can then be used by plants or animals (which eat plants, or eat animals that have eaten plants). Nitrogen can be fixed either by lightning, industrial methods (such as for fertilizer), in free nitrogen-fixing bacteria in the soil, as well as in nitrogen-fixing bacteria present in roots of legumes (such as rhizobium). Nitrogen-fixing bacteria use certain enzymes that are capable of fixing nitrogen gas into nitrates and include free bacteria in soil, symbiotic bacteria in legumes, and also cyanobacteria, or blue-green algae, in water. After being used by plants and animals, nitrogen is then disposed of in decay and wastes. 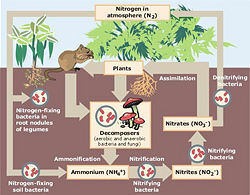 Decomposers and detritivores ingest the detritus from plants and animals and nitrogen is changed into ammonia, or nitrogen with 3 hydrogen atoms (NH3). Ammonia is toxic and cannot be used by plants or animals, but nitrite bacteria present in the soil can take ammonia and turn it into nitrite—nitrogen with two oxygen atoms (NO2). Although nitrite is also unusable by most plants and animals, nitrate bacteria change nitrites back into nitrates, usable by plants and animals. Some nitrates are also converted back into nitrogen gas through the process of denitrification, which is the opposite of nitrogen-fixing; this process is also called nitrification. Certain denitrifying bacteria are responsible for this. The oxygen cycle is the biogeochemical cycle that describes the movement of oxygen within and between its three main reservoirs: The atmosphere, the biosphere, and the lithosphere (the crust and the uppermost layer of the mantle). The main driving factor of the oxygen cycle is photosynthesis, which is responsible for the modern Earth's atmosphere and life as it is today. If all photosynthesis were to cease, the Earth's atmosphere would be devoid of all but trace amounts of oxygen within 5000 years. The oxygen cycle would no longer exist. CO2 + H2O + energy → CH2O + O2. An additional source of atmospheric oxygen comes from photolysis, whereby high energy ultraviolet radiation breaks down atmospheric water and nitrite into component molecules. The free H and N atoms escape into space leaving O2 in the atmosphere: 2H2O + energy → 4H + O2. 4FeO + 3O2 → 2Fe2O3. Oxygen is also cycled between the biosphere and lithosphere. Marine organisms in the biosphere create carbonate shell material (CaCO3) that is rich in molecular oxygen. When the organism dies, its shell is deposited on the shallow sea floor and buried over time to create limestone rock. Weathering processes initiated by organisms can also free oxygen from the land mass. Plants and animals extract nutrient minerals from rocks and release oxygen in the process. The following tables offer estimates of oxygen cycle reservoir capacities and fluxes. These numbers are based primarily on estimates from Walker (1980). The absorbed solar energy also raises the temperature of the atmosphere within the ozone layer, creating a thermal barrier that helps trap the atmosphere below (as opposed to bleeding out into space). There is an interesting theory that phosphorus (P) in the ocean helps regulate the amount of atmospheric oxygen. Phosphorus dissolved in the oceans is an essential nutrient to photosynthetic life and one of the key limiting factors. Oceanic photosynthesis contributes approximately 45 percent of the total free oxygen to the oxygen cycle (largely from algae). The population growth of photosynthetic organisms is primarily limited by the availability of dissolved phosphorus. One side effect of mining and industrial activities is a dramatic increase in the amount of phosphorus being discharged to the world's oceans. However, this increase in available phosphorus has not resulted in a corresponding increase in oceanic photosynthesis. An increase in photosynthesizer population results in increased oxygen levels in the oceans. The elevated oxygen levels promote the growth of certain types of bacteria that compete for uptake of dissolved phosphorus. This competition limits the amount of phosphorous available to photosynthetic life, thus buffering their total population as well as the levels of O2. All of these components are reservoirs of carbon. The cycle is usually discussed as four main reservoirs of carbon interconnected by pathways of exchange. The reservoirs are the atmosphere, terrestrial biosphere (usually includes freshwater systems), oceans, and sediments (includes fossil fuels). The annual movements of carbon, the carbon exchanges between reservoirs, occur because of various chemical, physical, geological, and biological processes. The ocean contains the largest pool of carbon near the surface of the Earth, but most of that pool is not involved with rapid exchange with the atmosphere. Major molecules of carbon are carbon dioxide (CO2), carbon monoxide (CO), methane (CH4), calcium carbonate (CaCO3), and glucose (in plant organic matter,C6H12O6), and many others, as well as many ions containing carbon. The global carbon budget is the balance of the exchanges (incomes and losses) of carbon between the carbon reservoirs or between one specific loop (e.g., atmosphere-biosphere) of the carbon cycle. An examination of the carbon budget of a pool or reservoir can provide information about whether the pool or reservoir is functioning as a source or sink for carbon dioxide. The phosphorus cycle is the biogeochemical cycle that describes the movement of phosphorus through the lithosphere, hydrosphere, and biosphere. Unlike many other biogeochemicals, the atmosphere does not play a significant role in the movements of phosphorus, because phosphorus and phosphorus-based compounds are usually solids in the typical ranges of temperature and pressure found on Earth. Phosphorus normally occurs in nature as part of a phosphate ion, consisting of a phosphorus atom and some number of oxygen atoms, the most abundant form (called orthophosphate) having four oxygens: PO43-. Most phosphates are found as salts in ocean sediments or in rocks. Over time, geologic processes can bring ocean sediments to land, and weathering will carry terrestrial phosphates back to the ocean. Plants absorb phosphates from the soil. The plants may then be consumed by herbivores, which in turn may be consumed by carnivores. After death, the animal or plant decays, and the phosphates are returned to the soil. Runoff may carry them back to the ocean, or they may be reincorporated into rock. The primary biological importance of phosphates is as a component of nucleotides, which serve as energy storage within cells (ATP) or, when linked together, form the nucleic acids DNA and RNA. Phosphorus is also found in bones, whose strength is derived from calcium phosphate, and in phospholipids (found in all biological membranes). Phosphates move quickly through plants and animals; however, the processes that move them through the soil or ocean are very slow, making the phosphorus cycle overall one of the slowest biogeochemical cycles. Phosphates may be extracted from the soil to be incorporated into artificial fertilizer. However, fertilizers not absorbed by plants mostly enter the groundwater and collect in lakes and ponds. The extra phosphates are a major contributor to the process called eutrophication, which causes excessive growth of water plants and algae populations. Sulfur is one of the constituents of many proteins, vitamins, and hormones. It recycles like other biogeochemical cycles. Mineralization of organic sulfur to the inorganic form, hydrogen sulfide: (H2S). Oxidation of sulfide and elemental sulfur (S) and related compounds to sulfate, (SO42-). Reduction of sulfate to sulfide. Assimilative sulfate reduction, in which sulfate (SO42-) is reduced to organic sulfhydryl groups (R-SH) by plants, fungi, and various prokaryotes. The oxidation states of sulfur are +6 in sulfate and -2 in R-SH. Desulfuration, in which organic molecules containing sulfur can be desulfurated, producing hydrogen sulfide gas (H2S), oxidation state = -2. Oxidation of hydrogen sulfide, produces elemental sulfur (So), oxidation state = 0. This reaction is done by the photosynthetic green and purple sulfur bacteria and some chemolithotrophs (organisms using inorganic compounds for ATP production). Further oxidation of elemental sulfur by sulfur oxidizers produces sulfate. Dissimilative sulfur reduction, in which elemental sulfur can be reduced to hydrogen sulfide. Dissimilative sulfate reduction, in which sulfate reducers generate hydrogen sulfide from sulfate. Human impact on the sulfur cycle is primarily in the production of sulfur dioxide (SO2) from industry (such as burning coal) and the internal combustion engine. Sulfur dioxide can precipitate onto surfaces where it can be oxidized to sulfate in the soil (it is also toxic to some plants), reduced to sulfide in the atmosphere, or oxidized to sulfate in the atmosphere as sulfuric acid, a principal component of acid rain. The water cycle—technically known as the hydrologic cycle—is the continuous circulation of water within the Earth's hydrosphere, and is driven by solar radiation. The hydrosphere includes the atmosphere, land, surface water, and groundwater. As water moves through the cycle, it changes state between liquid, solid, and gas phases. Water moves through different reservoirs, including ocean, atmosphere, groundwater, rivers, and glaciers, by the physical processes of evaporation (including plant transpiration), sublimation, precipitation, infiltration, runoff, and subsurface flow. Precipitation, which is the falling of water in any form to earth; infiltration, which is the process in which water is absorbed into the soil (it may also flow off the surface called surface run off); evaporation or transpiration, which occurs either when water is heated and turns into water vapor or when plants use the water and give it off as water vapor, respectively; and condensation, which occurs when water vapor cools and forms clouds. This process is then repeated over again. The total amount, or mass, of water in the water cycle remains essentially constant, as does the amount of water in each reservoir of the water cycle. This means that rate of water added to one reservoir must equal, on average, over time, the rate of water leaving the same reservoir. The largest reservoir is the collection of oceans, accounting for 97 percent of the Earth's water. The next largest quantity (2 percent) is stored in solid form in the ice caps and glaciers. The water contained within all living organisms represents the smallest reservoir. The volume of water in the freshwater reservoirs, particularly those that are available for human use, are important water resources. The residence time of a water molecule in a particular reservoir varies greatly from the order of seconds to hours and days (as in evaporation of precipitation) to much longer time scales of thousands of years. Groundwater can spend over 10,000 years underground before leaving, and ocean water can be on the order of a thousand years old. Hydrogen is a key component of many biogeochemical cycles, including the the water cycle, carbon cycle, nitrogen cycle, and the sulfur cycle. Because hydrogen is a component of the water molecule, the hydrogen cycle and water cycle are deeply linked. Plants also recombine water and carbon dioxide from the soil and atmosphere to form glucose in a process known as photosynthesis. If the plant is consumed, the hydrogen molecules are transferred to the grazing animal. The organic matter is then stored in soils as the plant or animal dies, and the hydrogen molecules are released back into the atmosphere through oxidation. Cloud, P. and A. Gibor. 1970. The oxygen cycle. Scientific American, September:110-123. Morris, R. M. 2006. 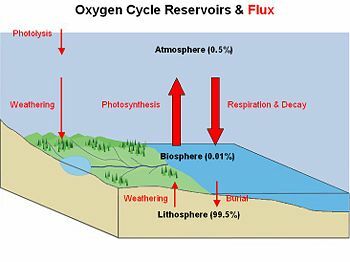 OXYSPHERE: A Beginners' Guide to the Biogeochemical Cycling of Atmospheric Oxygen. Retrieved November 6, 2007. Walker, J. C. G. 1980. The Oxygen Cycle in The Natural Environment and the Biogeochemical Cycles. Berlin: Springer-Verlag. This page was last modified on 7 January 2014, at 00:07.